Prositions Helps Thousands of Veterans On The Job | Prositions, Inc. Prositions Helps Thousands of Veterans On The Job | Prositions, Inc. 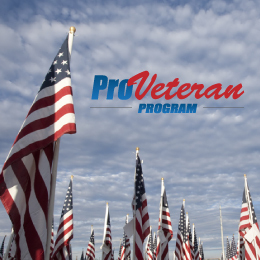 Within the past few months Prositions has assisted thousands of veterans in the civilian workforce with their ProVeteran Program. The program enables U.S. veterans to take control of their careers by providing resources to successfully transition from the structure and direction they are used to in the military. These veterans are employed at organizations of varying sizes and industries throughout the United States. At the heart of the ProVeteran Program is Prositions’ cloud-based mentoring software, MentorString. Organizations who participate in the program receive free setup, implementation, branding, training, and user support of MentorString. The only thing organizations need to provide is a program administrator and internal mentors and coaches who are excited to help veterans create a new community. Prositions, Inc. is a rapidly growing talent transformation consulting firm that offers virtual mentoring software and services, career transition assistance, and development solutions using the True Development Model. By combining the power of technology with an international network of coaching experts, they are revolutionizing development programs. MentorString, their award-winning cloud-based software, enables organizations to leverage virtual mentoring, engage in secure collaboration, and access high-quality individual development plans with content from industry leading authors and producers. For more information about Prositions, visit https://prositions.com.